Ah, damnit, there was a whiff of why us? 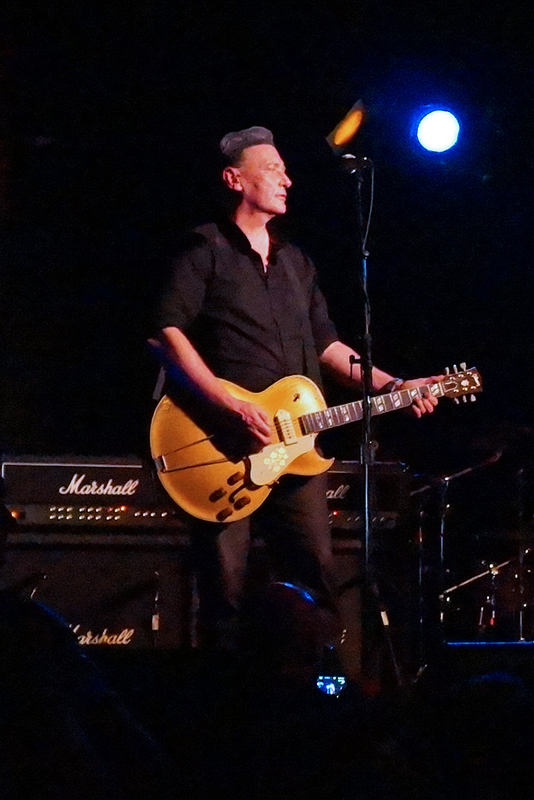 hanging in the air during Killing Joke’s Toronto show this week (Wednesday, April 24th). British legacy bands only swing through town every three or four years, so the “missing drummer/ill singer/abbreviated setlist” trifecta isn’t the kind of parlay a betting fan might place with much enthusiasm. I’ve gobs of affection for Joke on so many classic symbiotic levels – for the artistic temperament to close shop after a brush with mainstream temptation, for the original quartet reuniting in 2007 for all the right reasons, for making increasingly wicked records over the past decade – but drummer Paul Ferguson’s decision to skip the Montreal and Toronto shows to tend to an art gallery event rankled. From the band that refers to its shows as tribal gatherings and closed its 2006 LP with a song about fan-band synergy (called “Gratitude,” for crissakes), this wasn’t especially comradely. It’s an 11-date tour, Paul. Come on. And when Jaz Coleman issued his lone spoken address after just one song – “Well, my voice is completely gone. But we will play on.“ – the Joke swerved towards the farcical. But hey, you attend enough rock shows, you’ll catch some from depleted crews. 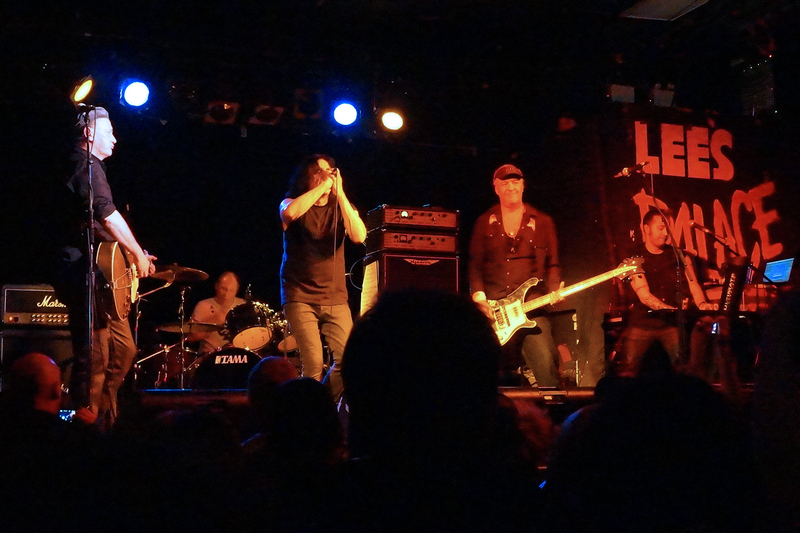 Toronto’s wasn’t a limp performance: Killing Joke is a rock ’n’ roll rottweiler. But as an ipso facto statement, the Lee’s Palace crowd got short-changed. Now, who among us hasn’t wondered, What if Jaz Coleman ever got a sore throat? Here’s what that’s like. Pangs of dejection from the singer at several turns: after a note he couldn’t hammer home; by clutching motions made at his throat; in exercising his field general’s authority to begin cherry-picking from the setlist 35 minutes in. After eight songs Jaz paused. Walked over to a song list taped to the bass amp stack. I typed uh-oh into my notes: the great cull was underway. The first song after the pause was the closest thing to a pop tune in the roll call – “Eighties” – Jaz only managing foggy shouts in place of his usual melodic barking. But then “Whiteout” followed, his vocal hard and clear over the stampeding industrial blur. Next up, “Asteroid,” which made me laugh, because it’s the roughest ride imaginable for a suffering singer. You’d forgive him if he’d taken the soft option, called for “A Southern Sky” or one of Joke’s quasi-instrumentals, but he chose paint-peeling intensity, throwing a defiant middle finger at the common cold. I do not recall him taking a sip of anything during the entire ordeal. Push, push, struggle. I saw the setlist later. They’d planned 19 songs. We’d get 14. Economy of movement: I once saw George Foreman score a KO off a flick of the wrist. Geordie Walker could probably play with his in a cast. His chording hits with Foreman-like force, yet he hardly moves. Lack of trad rock posing is his allure. It’s absorbing theatre, this measured, minimalist input producing such jaggedly plangent results. The production detail in recorded Killing Joke often gets lost in the murky acoustics of small clubs. I’ve heard clearer mixes at Lee’s Palace from bands with three guitarists, so maybe the house sound just couldn’t figure out Walker’s cement mixer grinding. Similarly, Youth’s low and heavy basslines provided momentum without much definition. Still, the attack’s as compelling as a steamroller. On the groove tracks – “Wardance,” “Bloodsport,” “The Wait” – standing still is not an option. Cue the slam dancers. And “Madness” is transportive, perhaps the perfect Killing Joke song. Gripped by dissonant guitar howls, a loping bass run, tribal drumming and shouted pass-the-hat vocals, its deployment of powerful rock elements into such a punishing – but spacious – quilt of sound is amazing, almost Who-like in how it highlights individual brilliance without actual soloing. The madness could’ve gone on twice as long and we’d’ve been the better for it, what with our blistered cochleas and jellied knees. Rottweilers. After the one-song encore, a pulsating “Pssyche” introduced (and co-sung) by Youth, Jaz extended a sincere Namaste to the crowd and left the final bows to his mates. The 62-minute, pock-marked gig won’t be a bootleg favourite, but it was a pretty ballsy effort from a determined crew. I sure hope the art gallery thing went well, too. Props to Pitchshifter drummer and Joke associate Jason Bowld for sitting in for Ferguson. He doesn’t have the dance-beat pep implicit in Ferguson’s playing, but he’s clearly familiar with the band’s canon, and was plenty heavy. As ever, Reza Udhin handled the dirty synths, and also assumed Ferguson’s “Madness” vocal part. The dropped songs were “Sun Goes Down,” Money Is Not Our God” and “Corporate Elect” in the main set; “Change” and “The Death & Resurrection Show” were intended for the encore. I also reviewed a Killing Joke concert in 2010. This entry was posted in Concert Reviews and tagged Killing Joke. Bookmark the permalink. I went to last night’s Chicago show. Reza says Jaz has been sick. Their show had started out with technical difficulties. Show ended abruptly. Very short playlist with no real encore. 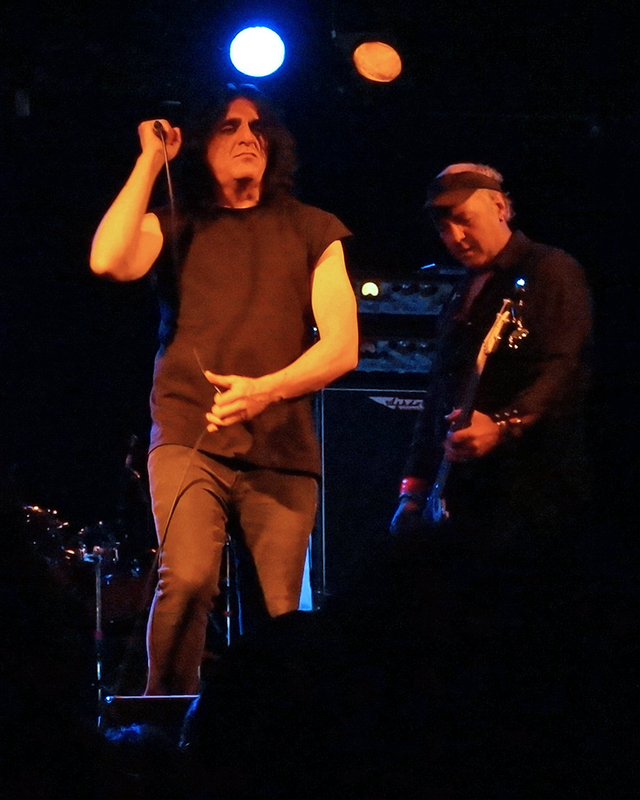 Killing Joke sounded great though. There was intense enthusiasm in the audience. I just hope tonight’s show will be better. Sounds pretty similar to Toronto. An in-the-know acquaintance of mine interviewed Youth before Toronto, claiming Jaz kept silent while someone ran a tea kettle into the bus. Shame about the compromises, but as you said, the band plays it fierce. The crowd adjusted, too: the mood was pretty upbeat, I’d say. They played all the tunes from the Toronto set list Fri night in Chicago, with Euro Superstate swapped in for Bloodsport, and Money & Sun Goes Down added back in. I’m not sure about Empire Song (they played that during the Sat early show but not the late show), but there was a two-song encore Fri night (Change & and extended version of Pssyche). So it wasn’t a “very short” set by this tour’s standards — just two songs shy of most single-date gigs. Maybe Nikki smoked too much and has a foggy memory? Sat night was the longest of the three (the Sat early show was shortened like the Toronto set), with Corporate Elect and Death & Resurrection Show added back to the set. No, Paul didn’t play in Chicago. But honestly, I was remarking to my friend after Friday’s show on the drummer’s strength and thought that he sounded stronger than ever — especially surprising for an old geezer! It was only the next day that I realized it wasn’t Paul! (There’s no drum riser at the Bottle and from where we were standing I couldn’t really see the drummer). So Paul’s absence was no problem at all musically. I maintain it’s annoying BPF skipped – now, at minimum – four of the 11 tour nights. You always wanna dance with the ones what brung ya. But yeah, it’s to both Joke *and* Bowld’s credit BPF’s absence was mitigated so effectively.